After arriving in Sydney Kris and Eileen joined a Sydney dragon boat club, Mavericks, and they are enjoying the tough training 3 nights a week. Anneka and Jack have also continued with dragon boating, Anneka competed with the Australian team in Penang in July and Jack has also taking up water polo. News update: December 2008 In December 2008 Kris and Eileen gained a place on the NSW State Masters team after a gruelling selection trial – well done guys! They are hoping a win at the Nationals will get them a seat in the boat for the Internationals in Prague. In the meantime they are off to Hong Kong to compete in the Stanley Cup in May. I hope they remember that Forza introduced them to dragon boating! News Update: April 2009 Eileen & Kris had a great Nationals. With the New South Wales team Eileen won two Golds, (Masters Mixed & Masters Womens), Kris won Gold for the Masters Men, and they both collected silver with their club for the Premier Mixed. Kris is now an accredited sweep and Eileen & Kris are trying out for the Australian Masters squad and are hoping to do well as they both ranked well in the NSW trials. They are also going to start outrigging with the Pacific Dragons. We were both thrilled by the experience, and the beautiful venue was pretty special too. Eileen and I won bronze in the Masters 200m Open – a real nail biting finish with Aus pipping the Czechs out of the medals by 0.009 of a second! Canada 44.468, Russia 45.526, Australia 49.151, Czech Rep 49.16, Germany 50.163, USA 50.348. I added some special photos that we asked the men’s crew to be part of – everyone was pleased to do them for us – and I call them our ‘True Colours’ shots… we carried our Forza top all the way to Prague with us as a reminder of where we got our start in Dragon Boating and to say thank you to everyone in the club for all the support, guidance and help that got us to the point that allowed a dream like that could come true. So, anyway – THANK YOU FORZA! I really hope that everything is going well for everyone over there and that the club and all its members are having all the success and happiness that hard work earns for you. Scroll down below the photos to read more from Kris and Eileen. 1. What was your first impression of dragon boating – and what kept you continuing? We became involved in dragon boating through a ‘Have a Go Day’ organised by Forza. Our daughter Anneka spotted a large sign and asked us ‘Why don’t we go along?’. Anneka was in the process of ramping up her exercise regime in preparation for her fitness test prior to entry into ADFA as an officer cadet, so she was looking for something extra to add her the program. Dragon boating looked like something ‘different’, and we all loved being in and around the water in Bunbury, so we all piled in…. Eileen and I considered ourselves reasonably fit and healthy. Eileen in particular was always involved in one form of sport or another, often being active in more than one sport at a time but even so our first impression was of surprise at the effort required. All of the experienced Forza paddlers made it look so easy, but we were constantly fatigued. We all loved the teamwork and timing aspect of the sport – that was another surprise – we had originally thought that just pulling on the paddle would be enough, but quickly discovered that you could waste your energy by not keeping in time with the rest of the crew. What kept us going was the fact that finally we had found something that we could all be involved in together. Seeing the whole Harrison family in the boat at once gave us the impression that dragon boating could be something which could become a common interest for our whole family as well – and it has. Both of our kids are still paddling, Anneka paddled for Australia in Penang in 2008, and Jack is now the Treasurer of the ADFA Spartans dragon boat club in Canberra. 2. What things do you like about the sport – what do you get out of it? The most rewarding aspect of the sport, beyond the improvement in our physical health has been the lasting friendships we have made. I think it would be fair to say that Eileen and I are both quite reserved people until we get to know people, (at which point Eileen opens up and becomes a complete extrovert). Were it not for dragon boating we would probably be inclined to stay at home and would therefore not have many opportunities to meet other people. Dragon boating puts us out there. We have to interact with the team, and we need to understand and relate well with everyone in the boat. Having close contact with other people, and learning to trust and rely on them as sports people is a great way to develop trust and reliance as friends. Dragon boating has blessed us with the opportunity to meet so many great people that we would never have otherwise known, almost all of whom have become treasured friends. 3. How was it going from Forza to join a team in Sydney – what team are you with in Sydney? Our decision to leave Bunbury was almost made for us. Once both Anneka and Jack were accepted into the Australian Defence Force Academy Eileen and I felt that we needed to be a little closer to where they were going to be for the next four or five years. We didn’t want to live completely in their pocket, so Sydney was a natural choice – close enough to Canberra to feel like we could be part of their lives, but far enough away that they were going to have to fend for themselves as adults most of the time. The really hard part of that decision was the realisation that we would have to leave Forza. We had really only begun to establish ourselves at the club and Eileen in particular had made great improvements in her paddling. Paddling had become an integral part of our lives, and we had got into the habit of arranging all of our other business around our training and regattas. Leaving such a close-knit and supportive crew to go of goodness knows where was quite nerve wracking – we were not sure if any other club would look after us as well, or indeed if they would even be interested in us. For us, selecting a new club was a strange experience. We didn’t so much choose a club, as jump on the first passing boat. Prior to our departure, Eileen had taken a week off work to fly over to Sydney so that she could arrange rental accommodation for us. Before leaving she had made email enquiries to several Sydney clubs which she found on the internet. By the time she flew out only one had replied to her, Mavericks. The Mavericks recruiting officer at the time met Eileen in Sydney and took her down to meet the crew. When I arrived in Sydney a few weeks later we joined the club and have been there ever since. 4. What did you have to do to get into the National team? Selection for the National team followed on from selection for the NSW State squad. 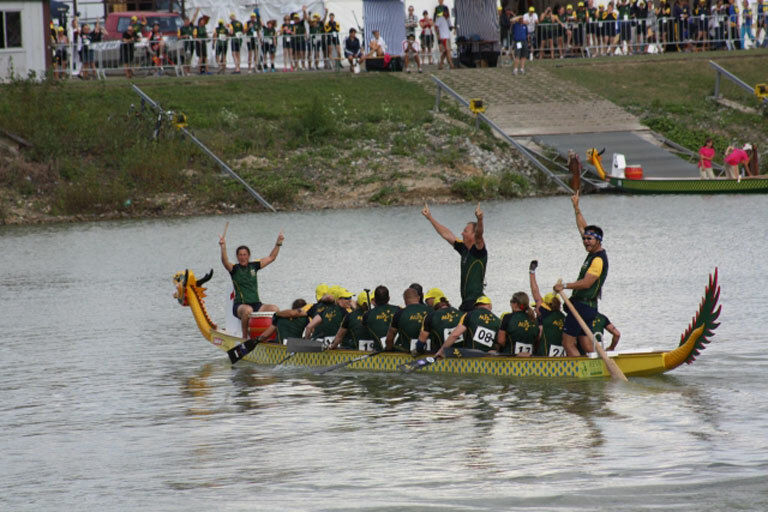 The rules for dragon boating, (currently under review to make a more National base), mean that the State crew which wins Gold at the Nationals wins the right to form the National squad. 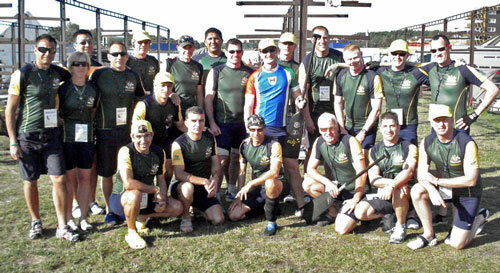 The State squad for NSW in 2009 comprised two full crews plus reserves (45 paddlers) in each of the male and female categories. Following a successful Nationals campaign, this squad was reduced to a single crew plus reserves, (23 paddlers), in each category. • ERG trials. The ERG is a modified rowing machine adapted to the dragon boating paddling technique. For our trials, each paddler had a timed 2 minute run on the ERG, attempting to paddle the furthest distance. A cut-off distance of 405m for men and 385m for women was applied with paddlers who could not achieve this requirement excluded from the next phase of testing. • Individual Water Trials. The individual water trials test the paddler by timing them while they single handedly paddle a full-sized dragon boat, complete with sweep and balance person across a measured distance, (230m for men, 200m for women). The raw times achieved are weight adjusted, (time added for people heavier than average, time reduced for lighter people), and the paddlers are then ranked according to their times. These trials were repeated several times during the course of the Aus preparations, but both Eileen and I consistently ranked among the top ten paddlers in the squad, leading to our selection for the mixed squad as well as our gender based team. 5. What training did you do for the Worlds Titles? Training for the Worlds was basically a seven day a week affair. We were required to train for at least two hours on the water at least five times per week. The Chief Coach maintained a tracking schedule for paddler attendance, which he published on a weekly basis so that everyone could see what everyone else was doing. This made sure that no-one wanted to appear to be slacking off. Because of the mix of training styles required, some for cardio base building, some for endurance, some for strength and power, we would often have many more than the minimum number of sessions to attend. The most I did in one week was eight on-water sessions, (morning and night sessions on multiple days). In addition to our on-water training, the Coaches required at least two gym sessions per week with a rigorous program developed from an AIS designed Olympic Squad regime. In the main, we were asked not to go lifting too many heavy weights, with the coaches preferring a lighter squad with high endurance over a bulky, muscle bound crew which may not have been able to maintain peak performance as long. 6. What was it like competing in Prague? Prague was an eye opener. We had been prepared for an increase in intensity by the coaches, but no amount of words can really make you understand what it is like to find yourself competing against the very best paddlers in the world. To say that it was an awesome experience does not do it justice. I think it would be fair to say that it took Australia a couple of days to really settle into the competition. A couple of days in which the Canadian crews pretty much dominated the entire regatta. By the third day, Australia had only won a half a dozen minor placed medals, usually by the narrowest of margins. All of the racing was very close, but none closer than the Bronze medal Eileen and I won, edging out the Czech’s by 0.009 of a second! The tension around the race venue while the organisers sorted out the photo finish in that race was enough to make you want to cry – especially when results for subsequent races came up and we thought they were ours…. It took about 30 minutes to sort out and when we heard we had placed third you would have thought it was first by the way we celebrated. The Mixed 500m race is probably the most prestigious of all of the races in any dragon boating regatta, its the one everyone wants to win and after so long without a gold medal, we wanted to win it more than anyone else I think. By then, everyone knew that the Canadians were favourites to win, so we had a group discussion prior to the race to work out what we would need to do to beat them. We knew we were better off the line than any of the other teams, but that the other teams were running us down in the middle section of the race, and beating us by milliseconds on the line. So we changed things – we extended our start to our full thirty stroke maximum, (normally reserved for the 200m race), and we changed the calls in the middle of the race to remind ourselves not to back off the pressure. These changes, along with a fair amount of angry mongrel determination certainly did the trick for us – we won gold in that event by nearly a full second over Canada, with Germany third. 7 What positions did you paddle in the boat? Due to my rankings in the water trials I was placed in the ‘Engine Room’ of the boat, in seat seven for the Men’s races and seat five for the Mixed races. I was in seat five during the Mixed 500m when we won the gold. 8. What were your feelings when you crossed the line first? When we went crossed the line I had no real idea of where we had placed. I had been so focused on paddling as hard as I could that I never even saw any of the other boats, they could have been ahead of us for all I knew. It was only when I looked around and saw all of the Australians on the bank screaming and yelling and then when I saw our sweep nearly jumping off the boat that it slowly dawned on me that we had won. After that I think my head exploded. All I can remember is yelling at the top of my lungs until I ran out of air. The Team Captain had stood up in the boat, (which is normally not allowed), and was yelling and waving like a mad man. The celebration for the close run Bronze was nothing compared to the party for what turned out to be a convincing Gold. I have never been so elated by anything in my life – except maybe watching the Aussie flag running up the pole during the medal ceremony afterwards, and knowing that I had played a part in making that happen. 9. What would you say to people perhaps interested in having a go at the sport? I would say that there is a place in dragon boating for everyone, no matter whether they are interested in full-on competition or just keeping fit. There are no limits to what you can do in the sport if you have the enthusiasm and just have a go. I don’t consider myself to be anyone special, and I am constantly surprised by how far dragon boating has taken me – all the way to a World Championship which is something I would never have believed of myself in a million years. Have a go and see how far it takes you. 10. Where do you go from here after reaching the pinnacle? What pinnacle? I think there are a few more goals to reach yet. The next Worlds are in Tampa Bay in Florida – and I hope to be there to show the Canadians just how much we deserved our gold medal, and maybe to take a few of theirs off them as well… I know what it takes to get there now, and I know a lot more about what I am capable of doing, so I’ll have less to worry about and more to feel confident of next time around. Go Aussies!! We are very grateful for that sheet sign that was put up on the fence for Forza’s ‘Have a Go Day’ The Oz team was quite difficult to get into, but I think we were more nervous about the State team initially a few months before. We had to do Erg and water trial for that. For the Oz squad we had to do just the water trial…that is 200m for me and 230m for Kris in a dragon boat with a person of similar weight and a sweep. Very tough I can tell you. I came 2nd in the Womens Masters and Kris came 7th in the men. The training was very intense and cold over winter. We had to do a minimum 5 water sessions per week plus 2 weight and 1 cardio session. We were constantly tired and our life revolved around training, being wet and cold and work. If you weren’t dedicated it would have been easy just to drop out. What team are you with now? How did Eileen hurt her ribs? Are you still enjoying Sydney? We are with Mavericks DB club, Pacific Dragons are too intense for us, but Mavs have got competitiveness and good friendship. I think it took us a while to get used to the traffic and chaos of Sydney, and I hated it at first, but you do get used to the way of life here. I hurt my ribs 10 weeks before Worlds, couldn’t shake it off and had to go for a bone scan due to the intense pain. It was discovered I had fractures on both sides of my left and right rib cage, so had to pull out as a paddler….to say I was devastated would be an understatement…I cried for 2 weeks because Kris was a constant reminder of what I had lost. However due to my weight and good voice they didn’t want to lose me completely so I was asked to drum for the Open team. Jack comes home nearly every holiday and comes to paddle with us and Mavs, so does Anneka. The new Forza Web Sitewasactivated on the first of January 2008. All past and present Forza Club members are invited to submit their stories, pictures and memories of the Club for the enjoyment of all. Forza sincerely thanks former paddler Kris McKechie for his work in designing and setting up our website before he transferred work, home and family to Sydney. Lucky for us, Kris is still on hand to help Forza with web site development. Thanks Kris and all the best for the future to you, Eileen, Anneka and Jack. 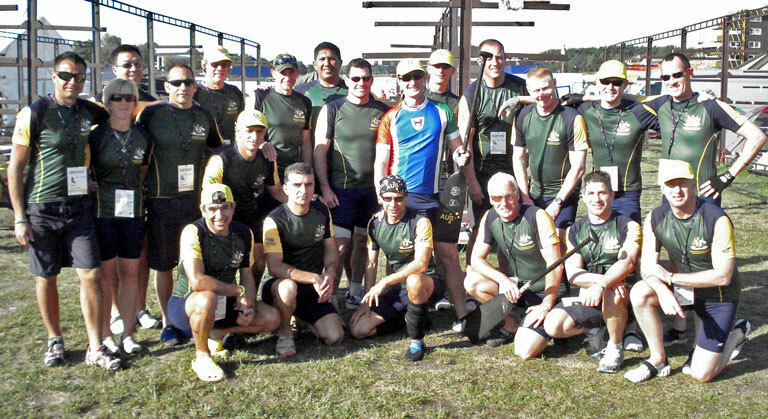 Sept 2009 Update – Kris and Eileen have recently returned from the World Dragon Boat Titles in Prague where they competed with the Australian team. Kris won gold with the Masters Mixed, and Kris and Eileen bronze with the Mens’ Masters. In the midst of all the excitement Kris and Eileen did not forget where they started dragon boating – with the Forza Dragon Boat Club – as you will see from the photo below (Kris in Forza shirt and Eileen second from left middle row) and when you click on the link to read more about Kris and Eileen at the Worlds, and their dragon boating life in Sydney. News from former Forza Paddlers Kris and Eileen McKechie. COME ON! GIVE IT A GO! And see how far YOU can go! 2011-2012 Recruitment Drive Now On! TRAINING STARTS FRIDAY 2 SEPTEMBER 5.30PM AT THE BUNBURY ROWING CLUB. HAVE A GO DAYS – Sundays 8th and 23rd October. More info soon! BRING A FRIEND and HAVE A GO! For dragon boat video footage, check out two new links “Dragon Boating That’s Our Sport” under the “What Is It?” tab. And under “Paddling Technique” on the “Training and Fitness” tab. Levels of Involvement in Forza In 2011-2012 Forza have four levels of involvement for members – Sports Paddling, Paddling for Fitness and Fun, Non-paddling, and Dragons Abreast. Click on the “Training & Fitness” tab then go to “Levels of Involvement” to see how you can be involved as part of the Forza Dragon Boat Club. Newspaper and magazine articles about our sport.Check out the latest newspaper and magazine articles for the current season and past seasons under the Media Tab, including an article from Australian Photography magazine about photographing dragon boat racing. CLUB DATES & SOCIAL EVENTS -Please go to the Event Calendar tab to check club dates and social events for the season. There are four marathons planed for the coming months. The 1st is in Denmark on the 19th May which is 25km. 2nd is Mandurah on the 30th June, 3rd is in conjunction with the Avon Descent on the 5th August (this event may not happen it is still in the planning stage) and the 4th is the Bridge to Bridge around October. CONGRATULATIONS & GOOD LUCK TO FORZA members going to the National Championships in Melbourne. The 2012 Australian Dragon Boating Championships is being held in Melbourne Victoria from 31st March to 5th April. It will be an exciting time for Melbourne to play host to a magnificent event and also for dragon boat crews, clubs and paddlers to compete. Forza members will be competing in only the 10’s racing in the premier women, premier mixed, masters mixed and grand masters mixed over 200 and 500 metres. It has been a long time coming, but on Sunday Forza did themselves and regional paddling proud with 3 medals at the WA State Titles on Sunday. Congratulations everyone – all paddlers (and supporters) – what a fantastic result! What an awesome day, we went to state championships today with 24 people, entering 3 divisions and walked away with 3 medals!!!!!!!! Mixed 2000m SILVER!!!!!!!!!!! I just need to say it again……what a F! @#$$%%G awesome 2000m!!!! Congratulations to all of you! We hit hard from the first race and never let up! Merinda and I would like to thank you all for a great day and as you can see our training has paid off!! Also a big THANK YOU goes to our wonderful volunteers….Sue from Denmark Dragon Boat Club, Lefty and Sean!! Without these people we wouldn’t have been able to paddle and win our bling!!!!! Once again CONGRATULATIONS to everyone, I hope you are all as proud of yourselves as Merinda and I are proud of you. Congratulations to the Forzas Open 10s who won bronze at the WA State 10s Titles at the Forza regatta in Bunbury on Sunday 4 March. And many thanks to all paddlers, supporters and volunteers who helped make the State 10s Titles a success both on and off the water. On behalf of the club and myself I would like to extend my sincere thanks to you all for your outstanding efforts on Sunday. To the Social Committee who organized all the food and raffle, set up and cleaned up etc I wish to pay special tribute to as it was an enormous effort (and at times under some trying and demanding circumstances). To the Executive who provided valuable assistance and support over several months in arranging the logistics of the day I am very appreciative of all your efforts and the time you put into this. Thank you Neville for making the toggles. They were an outstanding success. Thank you for producing the program. Thank you to all the people who helped to organize getting volunteers and sponsors. Every little bit helped to ensure that the day ran well. And, it was the only DBWA event that ran on time this season so that was an outstanding achievement by all. Merinda and Nic have done an excellent job preparing and organizing the crews for racing. This is a much bigger challenge than most people understand or appreciate, The results of their efforts are reflected in some very creditable results on the day from a club that is low on numbers when compared with other clubs. I really appreciate the time and effort that everyone put in setting up and taking down all the gear. I was very impressed with the cooperation and enthusiasm shown by all. You are all a very special group of people and you all deserve to be extremely proud of your contribution to the day’s success. We will be adding a day to our training schedule!! Sunday training will start on the 20th November 2011. Be there at 9am for a 9.30 start. Bring along your friends! More paddlers means more fun, more competition, more wins = more fun! HAVE A GO paddling dates for prospective paddlers – SUNDAY 9th and 23rd OCTOBER 2010 – 10.30am Bunbury Rowing Club. If you are interested in finding out what dragon boating is about, or know someone who would like to try dragon boating, bring them along, and COME DOWN & HAVE A GO! All welcome. Please contact the coaches for more information. The last day for training before Christmas will be Tuesday 20 December, with training recommencing on Tuesday 3rd January. We wish you all a safe and happy Christmas and all the best for 2012. We hope everyone has enjoyed their time out from paddling and for those that have been paddling on Sundays hope you have been inspired to do great things this season. Tuesday and Friday night training will be resuming on the 2nd of September 5.30. Please bring a friend – all welcome! Please make sure that to training you wear joggers for the warm up and also bring a water bottle. If you are running late, no problems, but you will still be expected to warm up, this is a vital part of injury prevention! On Friday nights we often have a social get together and a few drinks after training at the Rowing Club. So bring a towel and a change of clothes. CONGRATULATIONS MERINDA AND NICOLE for completing your Coach’s Accreditation. I wish to thank all the previous Board and Committee members who worked so hard over the past twelve months. Your efforts were outstanding and the Club really appreciates what you achieved. I am really looking forward to the new season and hope everyone is prepared to share the “paddling dream” that will make our Club strong. If you think you can fill one of the remaining positions or you would like to join the social fundraising committee please contact Mark Kusin. Thank you. To contact any of these people, please go to the “Contacts & Info” tab. Mark has been paddling for Forza since he was 16 yrs old! This year on the 31st August Mark turns 30! That means for 14 years Mark has been a Dragon Boater! Mark, aka “Muscles” has been an integral part of the Forza squad, he is one of our most experienced strokes and takes his position as Assistant Property manager very seriously. Mark enjoys the social aspect of dragon boating and likes to have a beer with his buddies. Mark is a well loved member of the squad and can always be relied upon for a hug and a laugh. We hope Mark continues his passion for dragon boating for another 14 or more years. Everyone should be doing something over the offseason to keep fit and to give us an edge at the beginning of next season. To be held at the Vat 2 Restaurant, Bunbury, 8.30am for breakfast followed by the AGM. SAUSAGE SIZZLE, Bunnings Bunbury, Sunday 24 July. Please contact Suzanne Ray on 0408242355 or suzanneray@bigpond.com and put your name down on the roster. We need five people per two hour shift. Remember – many hands make light work. It is a lot of fun and with everyone pitching in to help your two hours will fly by. PIZZA and BOWLING night – Saturday 9 July. Congratulations to our Award recipients at the Forza End of Season windup: Rookie – Callum Millard, Coach’s Award – Robert Harding, Most Improved – Amy Webster, Club Person Award – Merinda Fenn. Also a huge thankyou to Suzanne Ray and her team for the organisation on the night. We had a wonderful meal and everyone got into the spirit of the “Australiana” theme. A reunion of rowing, dragonboating, outrigging and any other paddling sport conducted from the club, will be held at the Bunbury Rowing Club on Saturday 16 April, from 7.30pm till late. Tickets $10. Light supper and live music. Come along and catch up with past club members and rivals, and relive past glories. It should be a great night. ALL WELCOME! The Forza Committee would like to sincerely thank it’s club members, sponsors, supporters and volunteers for a wonderful day on Sunday at the State 10s Titles. Despite not winning on the water, Forza once again ran a very professional event which could not have been achieved without the help of everyone involved. Thank you. It is hoped that the 10s State Titles in Bunbury will become an annual event. Our thanks also to our coaches Merinda Fenn and Nicole Kenny, who have done a great job with the crew all season. Our results on the day were – Women 4th, Open 6th, Mixed 6th, 1000 metre 6th. We hope that next season will see Forza with a bigger, stronger crew, and better results on the water. The next event will be the 20s State Titles over 500 and 200 metres at Champion Lakes on Sunday 20 March. A proposal for Forza to run the States 10s Titles in March 2011 was approved by the State Body (DBWA) last Monday. This is a huge bonus for our club as it will substantially increase the number of paddlers coming to our event next year. The Forza Board needs assistance with organising the After Party and the Accommodation components of this proposal. People involved in this sub-Committee will receive free entry to the After Party. Please contact me ASAP if you are able to assist. For more information on the State 10s Titles, please go to the “States 10s Titles” tab in the index bar. Want to get involved in the Aqua Spectacular? NOMINATE YOUR NOVICE CREW NOW! As well as hosting the States 10s Titles, Forza is hosting a NOVICE dragon boat paddling event. Teams can be sporting clubs, corporate groups, school teams, or just a group of friends out for a fun time on the water. The format: Three races over 200 metres, novice crews, maximum of 16 in a team and maximum of 10 in a boat, Mixed teams but maximum of 5 and minimum of 3 men in the boat, training sessions will be arranged for each team, Entry fee is $10 per paddler to cover administration and insurance. Nominations close Monday 28 February. What is a great way to finish a day of competition and fun on the water – PARTY! Join us at the Bunbury Italian Club for the beach theme AFTER PARTY – and dance the night away! See you there! Forza strongly advises that you organise your accommodation and reserve your tickets for the State 10s After Party now! After Party – 5pm Sunday 6th March, Bunbury Italian Club, Live band, Sit down buffet, Licensed bar. Beach wear and sensible footwear. For catering purposes, we ask that your reserve your tickets now. Thank you. Come and party and celebrate after a great day on the water! Forza competed in 9 races – the 500m mixed 20s, the 200m mixed 10s, and the 200m womens 10s. We came consistenly 3rd in the 500 mixed 20s, and put in a huge effort in the 200m mixed 10s to come 3rd in heat 1 and 2, and 1st in heat 3, slashing 8 seconds off our time in the November regatta. Congratulations to everyone, especially the new paddlers who put in an awesome effort. Forza’s new Head Coach Merinda Fenn and Assistant Coach Nicole Kenny praised the determined efforts of their paddlers and said their results in the Mixed, Forza’s traditionally strongest division, would boost the confidence of the crew. Fenn said that Forza’s new paddlers were continuing to improve their technique and strength and she is confident that with focused effort at training Forza will improve their placings over the season. For all the race stories over the season please look under the “Media articles” tab and results under “Forza Race Results” tab. We had a fantastic roll up at our Have A Go day on 24th October. 37 prospective paddlers came down to have a go. Thankyou to Merinda, Nicole, Lee-Anne and Neville for their coaching on the morning. Thankyou also to Forza paddlers who came down and assisted, Janette for organising the BBQ, Kate and Andy for cooking, our friend and supporter racer caller Keith Harvey for his attendance, Neville for the newspaper advertising, Jill for the newspaper article and to everyone who distributed pamphlets, put up banners, brought down friends etc. Awesome effort everyone. It was a really fantastic morning and we are looking forward to a great season both on and off the water. We are only as strong as are membership, so please everyone make our new paddlers welcome so they enjoy the experience and continue to help our club bigger and better! FRIDAY 10 SEPTEMBER 2010, 5.30PM AT THE BUNBURY ROWING CLUB All past, present and prospective paddlers welcome! Summer is here so get rid of those winter blues and at the same time get fit and have fun with a great bunch of people. COME ON GIVE IT A GO! ALL WELCOME! HAVE A GO paddling dates for prospective paddlers – SUNDAY 2nd and 24 OCTOBER 2010 – 10.30am Bunbury Rowing Club.COME DOWN & HAVE A GO! Saturday 4 & Sunday 5 September, 2010. Department of Sport & Recreation, 246 Vincent Street, Perth. 9am to 5pm. It is now a requirement of DBWA that all Clubs have an Accredited Coach. Congratulations and our sincere thanks to Merinda Fenn and Nicole Kenny for making the commitment to our club by attending this course. Please support them over the next 12 months as they complete the remaining units of the course. Saturday 21st August 2010, 9.30am Vat 2 Restaurant Congratulations to the following people who were elected to the Crewsaders Committee for 2010-211. * Co-Ordinator – Christine Penny, * Assistant Co-Ordinator – Joyce Pitman, * Secretary – Christine Shalders, * Treasurer – Jan Blakeman, * Property Office – Jan Blakeman, * Coach – Roz Webb, * Coaching Team – Kerry Graham (Registrar), Merinda Fenn, Lee-Anne Walters, Suzanne Ellis (fitness), * Public Relations/Publicity – Lizzie Hardy, Deirdre Moate, * Social/Fund-raising Committee – Suzanne Ellis, Amanda Jones, June Foulds, Vicki Holdsworth, Trish Gibbs, Deborah Jordan, * Meet & Greet New Members – June Foulds. Our sincere thanks to all these ladies. Saturday 26 June, 2010, 10.30am, Bunbury Rowing Club Congratulations to the following people who have volunteered their time, and were elected to the Committee. * Manager – Mark Kusin, * Assistant Manager – Neville McNeil, * Treasurer – Lee-Anne Walters, * Secretary – Josie Dean, * Head Coach – Merinda Fenn, * Assistant Coach – Nicole Kenny, * Public Relations/Publicity Officer – Neville NcNeil, * Fund Raising/Social Committee – Suzanne Ray and Josie Dean, * DBWA Representatives – Mark Kusin and Neville McNeil, * Property Officer – Lee-Anne Walters, * Assistant Property Officer – Mark Harrison, * Uniforms Officer – Nicole Kenny, * Website Officer – Jill Harrison, * Photography Co-Ordinator – Paul Harrison, * Crewsader’s Representative – Christine Penny. Our sincere thank you to all of these people for their contribution towards the running of the Club. If you have any questions for the committee or about Forza, please contact the appropriate committee person. Please see “Contacts & Info” page. The following awards were presented at the windup – Rookie – Rowie Jones, Coach’s Award – Josie Dean, Most Improved – Janette May. Interestingly all these people are first years poddlers. CONGRATULATIONS! Paul Harrison (Head Coach & Assistant Manager) was awarded the Club Person award. This was the first time that the Club Person had been voted on by all club members, not selected by the Executive Committee – so it is a great honour to be recognised by fellow paddlers. Congratulations Paul for your hard work for the club over the season and the past 20 years! The windup had a 60’s theme, and everyone joined in by dressing up in 60s gear. Well done to Suzanne Ray and the Social Committee for organising a fabulous night. The girls from Crewsaders entertained everyone with their dance skit, the Beach Boys “California Girls,” complete with bikini print Tshirts and sarongs. Saturday 15 May, 2010 The end of season windup celebration will be held at the Bunbury Commercial Club on Saturday 15 May for Forza and Crewsader members and partners. Club awards will be presented during the evening. Saturday 17 April, 2010 Can you believe it is five years since Jill Harrison, Julie Scott and June Foulds met for a cuppa at Henry’s Cafe in Bunbury – the question was – would we like to start a dragon boat club for women who had breast cancer and their supporters? Now five years on the Crewsaders are all very proud of their achievements – a group of women who meet regularly to have fun, keep fit and have a commitment to help other women who develop breast cancer. On Saturday 17 April 2010 the Crewsaders are celebrating their 5th birthday with morning tea and the launch of their new Champion Class boat, made possible by a Lotterywest Grant. Launch is at 10am followed by morning tea. All welcome! WA State Titles – Sunday 21 March 2010 Forza Dragon Boat Club competed at the DBWA State Dragon Boat Titles at Champion Lakes in Armadale on Sunday and retained their position as the top regional dragon boat club on the Grand Prix circuit again this season. Forza performed exceptionally well in the 2000 metre Mixed Division, knocking 41 seconds off their time since the first regatta in November, to finish in 10.11.23, only 12 seconds behind the winners, Hurricanes. This was an excellent result considering Forza were underpowered, paddling with only 6 men and 14 women compared to the other crews competing with 10 men and 10 women. Forza collected the third place trophy in the 200 metre Mixed Division, placed third behind Fremantle Swan and Perth Pirates over the three heats, and were fourth in the 500 metre Mixed. Forza’s best Grand Prix success for 2009-2010 was in the 200 metres women’s 10s Division winning Round 2 and 3 of the 4 round series. Originally designed in 2008-2009 to encourage smaller clubs to compete, the open and womens 10s was still contested by the bigger Perth clubs, making Forza’s wins a triumph for regional crews. Sunday 7 March 2010There were double celebrations for Bunbury supporters last weekend when Forza Dragon Boat Club won The Good Guys Premier Mixed trophy and their affiliate crew Crewsaders Dragons Abreast won the United Equipment Women’s trophy at the Forza Challenge Dragon Boat Carnaval regatta raced over 300 metres on the Leschenault Inlet on Sunday. Read the full story in Media Articles. Sunday 7 March 2010The Forza Challenge Dragon Boat Regatta is on again. For more information and registrations click on the “ForzaDB Challenge” tab. $1000 Cash in Prize Money! As an added incentive SOS Office Equipment has thrown in $1000 prize money – to be split between 2 divisions. So what are you waiting for! Get your friends together, nominate a crew, and come down for a great day! You might paddle away with the $500! DWBA Grand Prix Regatta # 3, 2009-2010 season. In scorching 42 degree heat at Champion Lakes on Sunday the Forza Dragon Boat Club’s women’s crew stamped their mark on the Womens 10s Division, when they won two of their three heats to claim the winners trophy from nine crews at Round 3 of the DBWA Grand Prix Series raced over 200 metres. Go to “Media Article” for the full story, and “Race Results”. DWBA Grand Prix Regatta # 2, 2009-2010 season.There was excitement in the Forza camp at Champion Lakes last Sunday when the Forza Dragon Boat Club women won two out of their three heats in the Women’s 10s for 10 paddlers over 200 metres to take the winners trophy at Round 2 of the Dragon Boating WA Grand Prix series. After taking first in heat one and second in heat two (won by Cockburn)the last heat promised to be a thriller between Forza and Cockburn. Expertly stroked by Jennifer Harrison and Erica Childs, and swept by Lee-Anne Walters, Forza leapt from the blocks in a very clean start in the windy and choppy conditions and were ahead of the field by the time they had finished their start sequence. They kept on the power and never looked like being overtaken, winning in a thrilling 0.56.43 ahead of Fremantle Swan 0.58.32 and Cockburn 0.58.81. Saturday 28 November 2009 – Albany weekend Five members of Forza and Crewsaders, Merinda Fenn, Lee-Anne Walters, Christine Penny, Jill Harrison and Rod Harrison (accompanied by Ian Penny) travelled to Albany with DBWA representatives, Vic Fazakerley, Rick Salisbury, and Jennie Ellis (Amazons) to assist the new Albany Dreaming Dragon Boat Club at their inaugural Come and Try Day at the Princess Royal Sailing Club on Saturday 28 November. It was a steep learning curve for the 75 participants, many of whom had never seen a dragon boat before. Along with paddling technique training, sweeps Merinda, Lee-Anne and Christine gave initial training to people wanting to try sweeping (a very important component of making the boat go straight!) With the turn out on the day and the strong and extremely enthusiastic committee, the new Albany club are sure to succeed. Forza wishes them all the best for the future, and hopes that we will be able to link up our two clubs again very soon. DWBA Grand Prix Regatta # 1, 2009-2010 season.The Forza girls carried the flag for Forza at the regatta on Sunday when they scored a 1st, 2nd and 3rd place in the Womens 200 metre 10’s division, against stiff oppostition from Cockburn and Fremantle dragon boat clubs. In the 200 metre Mixed 20’s Forza were consistently 4th behind Perth Pirates, Cockburn and Fremantle, and put on a gutsy team effort in the 2000 metre Mixed to finish 4th in 10.52 minutes (a new race distance for DBWA). All Forza’s new paddlers performed well, showing grit and determination against the bigger Perth clubs. Well done everyone for your efforts. We had a great day and Forza are looking forward to a fantastic season of paddling. Jill Harrison was honoured to be asked to perform the “Dotting of the Eye Ceremony” on behalf of Forza at the regatta, and Crewsaders sincerely thank Paul Harrison for transporting their new boat back from Perth to Bunbury – the second new Champion boat for the Bunbury fleet, made possible by a grant from Lotteries West. Early indications show that Perth Pirates, Cockburn and Fremantle will be the teams to beat this season. DBWA welcomed new comers The Lakers to the competition. Mandurah have boosted their paddler numbers following an extremely successful dragon boat festival on the Mandurah waterfront in April. Forza hope that Spirit of Bunbury will travel to Perth for the next regatta, Sunday 6 December. Have A Go Day – 10.30am Bunbury Rowing Club. Always wanted to give dragon boating a go, want to do something different on the water this summer, want to get fit, want to meet a great bunch of people? Then come down to our Have A Go day and give it a go! All welcome! Training commences Training for the 2009-2010 season will commence on Friday 4 September at 5.30pm at the Bunbury Rowing Club. See you all there, and bring a friend! Training will then be Tuesdays and Fridays at 5.30pm. All welcome. Two “Have A Go” days will be held at 10.30am Sunday20 September and Sunday 4 October. If you have ever wanted to try dragon boating, or know of someone who wants to give it a try, well now is your chance. Join us at the Bunbury Rowing Club, and have a go! Bring your friends. All welcome! You will receive in the mail some small flyers that you can give to anyone interested. For more information contact head coach Paul Harrison on 0408 979 976. Newspaper and magazine articles about our sport. Check out the latest newspaper and magazine articles for the 2009-2010 season under the Media Tab, including an article from Australian Photography magazine about photographing dragon boat racing. FORZA PLANNING DAY. Open invitation to all Club Members. We are holding a planning day and open discussion to plan for the future direction and promotion of the Club. Tell us what you want and how we can make our Club better. This is YOUR Club so please come along and have your say. All Club members welcome. We value your input. Flyers have been sent out to all members. CREWSADERS awarded Lottery West funding for purchase of a new boat and paddles.Congratulations. We look forward to the boat launch. FORZA AGM Forza held their 2009 AGM on Saturday. Look on “Contacts & Info” tab for the new Executive and Committee Members. Both the Manager Mark Kusin, and Head Coach and Assistant Manager Paul Harrison, thanked the Club members for their efforts over the season both on and off the water. We won all the regional events and were very competitive in Perth. The Club’s main aim for the coming season will be attracting and keeping new paddlers so that we can compete more competitively against the larger Perth clubs. It is envisioned that Forza will aim to have a “competitive” team and a “social” team to cater for both types of paddler. The 2009-2010 season will commence on Friday 4 September 2009 and finishing the weekend of the National Titles to be held in Adelaide 25 April 2010. Two “Have A Go” days will be held Sunday 20 September and Sunday 4 October. The first DBWA regatta will be Sunday 15 November. Club fees for 2009-2010 will be $170.00. Unfortunately a slight increase due to a rise in membership fees from both DBWA and the Bunbury Rowing Club. Crewsaders Co-Ordinator Chistine Penny announced that Crewsaders have received Lottery West funding towards the purchase of a new boat. 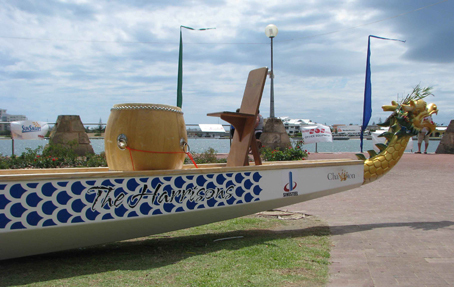 The Forza Regatta will be held on Sunday 7 March 2010 in conjunction with the Bunbury “Carnival” week. Forza are planning a “20th ANNIVERSARY” event in 2011 to celebrate Forza’s 20 years. Life Member Jill Harrison, stressed the importance of being involved in the Forza club and supporting the newly elected Executive and Committee members and the Coaching Team. “Over the last 20 years the dominant club has shifted from club to club. I believe with drive, enthusiasm, heart, determination and working together as a team on and off the water, we can achieve great things and once again Forza and Bunbury will be on the top of the sport”. DBWA PLANNING MEETINGPerth, lunch 12.30, meeting starts 1.30pm. Help planning for the future of the sport in WA. Please contact Forza Manager, Mark Kusin, if you are interested in attending. FORZA / CREWSADERS END OF SEASON FUNCTION A great evening was had by all thanks to the Forza Social Committee. Very worthy recipiants of awards on the night were:- Rooky – Rebecca Bonetti, Most Improved – Robert Harding, Coaches Award – Quaelan Brooks, Committment Award – Corinna Eatts, Club Person – Jill Harrison. The prestigious Club Achievement Award was presented to Merinda Fenn and Jill Harrison was the recipient of Forza’s first Life Membership for her services to the sport in Bunbury and Forza over the last 20 seasons. Crewsaders entertained everyone with their performance of “Putting on the Ritz”. FORZA / CREWSADERS END OF SEASON FUNCTION Forza and Crewsaders will be holding their end of season function on Saturday 16 May commencing at 6pm the Commercial Club in Bunbury. This is a chance to get dressed up in your best gear and dancing shoes for a fun filled night. For further information, please contact the Corinna and the Social Committee at forza-social@hotmail.com. AUSTRALIAN NATIONAL TITLES Three of Forza’s members, Lee-Anne Walters, Mark Kusin and Robert Harding will be joining the Western Australian State Team to compete at the National Titles at Caloundra in Queensland 23-26 April. We wish them well for the Titles, and thank those Forza members who have been coming along to training to help Lee-Anne, Mark and Rob with their preparation. FORZA / CREWSADERS WIN CHAMPIONSHIP TROPHY AT MANDURAH REGATTA Forza Dragon Boat Club finished off a successful season of regional dragon boat racing by winning the DBWA Club winner’s trophy at the Mandurah Regatta on Sunday, confirming their dominance of regional racing with three championship wins at the Harvey, Bunbury and Mandurah regattas over the 2008-2009 season. Forza and eight members of their affiliate crew Crewsaders Dragons Abreast Bunbury, represented Bunbury to compete at the Mandurah Regatta over a best of three series of races over 250 metres along the Mandurah Eastern foreshore. WA STATE DRAGON BOAT TITLES At the DBWA State Dragon Boat Titles at Champion Lakes in Perth on Sunday Forza recorded their best result of the Grand Prix Series with a second place in the Mixed 500 metres, and knocked four seconds off their time for this season in the Mixed 200 metres. Check out the story in Media articles. FORZA LAUNCH NEW BOAT Forza officially named and launched their new boat at the Forza Dragon Boat Challenge Regatta. The boat has been named “The Harrisons” in honour of the family’s 20 years (over 60 years combined) contribution and commitment to dragon boating and Forza. Check out the story under Media Articles and photos in the Image Gallery. Forza win at Forza Dragon Boat Challenge Festival Forza Dragon Boat Club thrilled their local supporters when they won the Worsley Alumina Premier Mixed champion trophy in perfect on water conditions at the Forza Dragon Boat Challenge Festival held on the Leschenault Inlet on Sunday to celebrate 20 years of dragon boating in Bunbury. Perth Pirates, Fremantle Swan, Mandurah Vikings, Harvey Harpoons and Forza battled for the trophy over a series of 4 races for mixed crews of 16 paddlers – three 300 metre heats, and a 400 metre time trial involving a turn at the half way mark. 20th Anniversary of dragon boating in Bunbury 17 March 2009 will mark the 20th Anniversary of the inaugural Dragon Boat Festival of Bunbury held on Saturday 17 March 1990 at the Bunbury Rowing Club on the Leschenault Inlet. The Forza Challenge Regatta on Sunday 1 March will be a celebration of this event – so come and help us celebrate! Also on that day will be the launch of the new Forza boat, proudly sponsored by Worsley Alumina and members of the Forza Dragon Boat Club. Check out these stories in Media Articles. Races will be over 300 metre and the regatta is open to Open and Novice crews to compete. So get your sporting, social, corporate or school group together, or just a bunch of family and friends, nominate your team and come down for a great day of racing and socializing. Forza will also be launching their new boat at the regatta, the first new boat to come into the Bunbury fleet in 14 years. The purchase has been made possible by generous donations from Worsley Alumina BHP Billiton, the Harrison family, and members of the Forza Dragon Boat Club.